As you can see, the sign is pretty much impossible to see and while it can be picked out on the video, realistically there is very little chance of seeing it while actually in motion. Of course, I should've looked at the "BUS LANE" text written on the road but I didn't. If the footage helps at all I've put it on youtube. Is there any way to challenge this? I really appreciate any help you can give me. 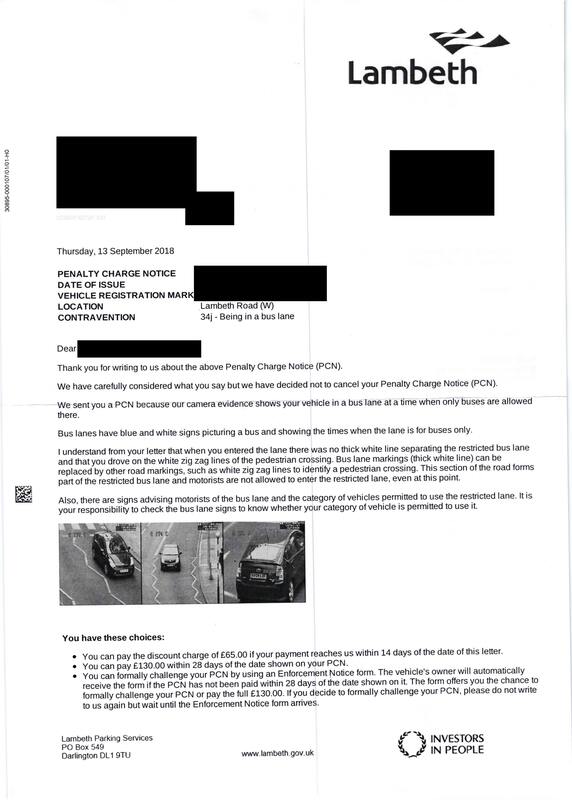 This PCN in in addition to another one I got recently and the fines are really starting to mount. OP---post up the video please. 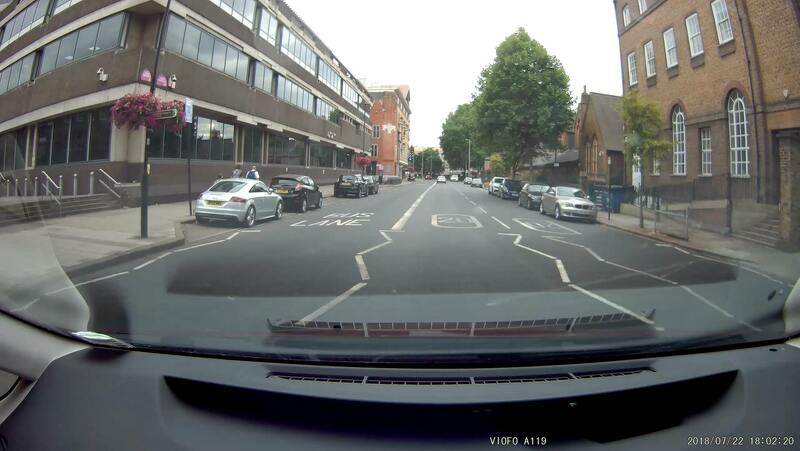 The photo on the PCN proves nothing because zig zags are not part of the bus lane. As a matter of fact I can't get into their website. The codes they've given me don't seem to work. I suppose I'll need to ring them about that tomorrow. It's interesting. They only have evidence of a short part of the bus lane driving that I did. Don't know if that matters. 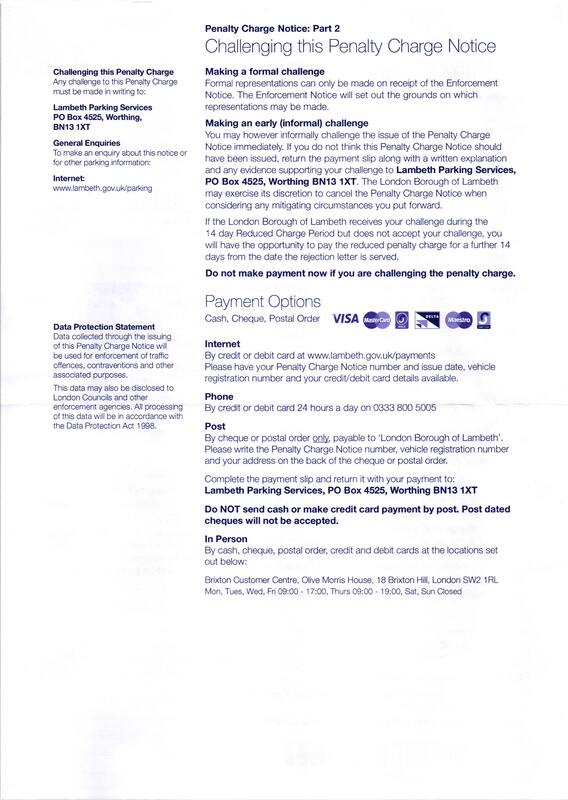 4(1) Where a council, on the basis of information provided by the use of a prescribed device, has reason to believe that a penalty charge is payable under this Part of this Act with respect to a vehicle, they may serve a penalty charge notice on the person appearing to them to be the owner of the vehicle. I think they probably have got enough. Ok, they have refused my informal challenge. Not sure what to do about it yet. The reduced fee period has restarted so I have a while to decide. What does this forum think? I think we've had adjudications saying the exact opposite, i.e. the zig-zags of a pedestrian crossing are not part of the bus lane. 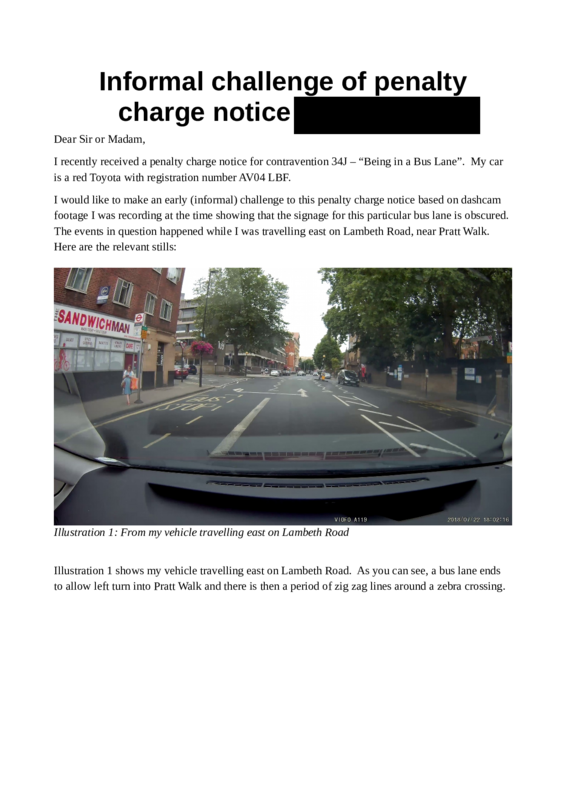 Mr. Stanley appeals against a penalty charge notice issued in respect of an allegation of a contravention of the prohibition on being in a bus lane. There is no dispute about the evidence. On Lambeth Road, south-west bound there is a sign properly indicating the entrance to the bus lane just after the junction with Pratt Walk and, thereafter, the bus lane is properly demarcated with a solid white line in accordance with item 1049A, which is item 11 in Part 6 of Schedule 9 to the Traffic Signs Regulations and General Directions 2016 (“the 2016 Regulations”). The solid line then stops and is replaced, on each side of the south-west bound carriageway at a point before the junction with Lambeth High Street, with the zig-zag road markings that are required to demarcate the limits of a zebra crossing. The solid white line then appears to resume at a point after that junction where there is a further ‘bus lane’ sign. 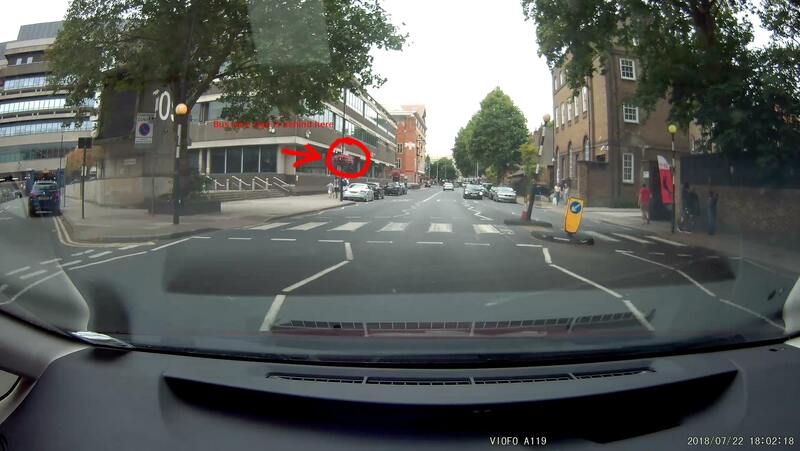 The CCTV footage shows Mr. Stanley’s motorbike remaining on the correct, off-side of the solid white line. As soon as that line stops, he steered his motorbike over the zig-zag lines into the nearside line that, on the EA’s case, is the bus lane. He did not cross over the solid white line. 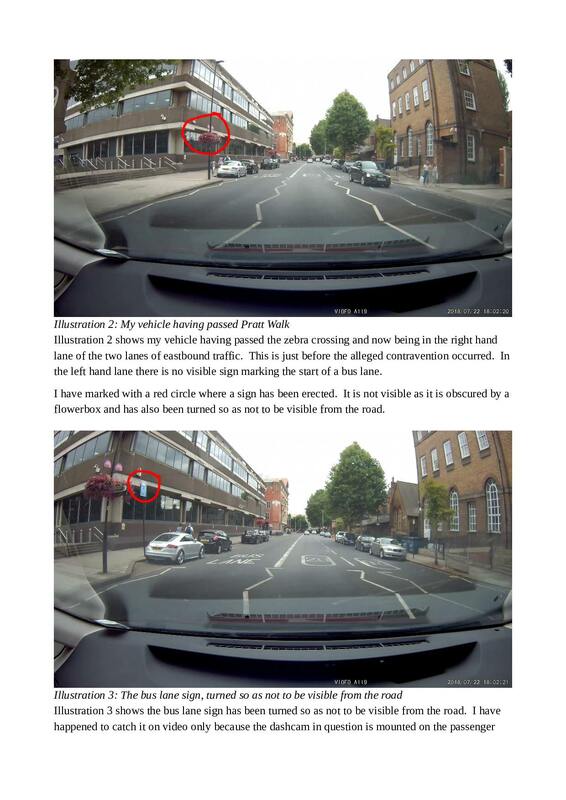 Mr. Stanley’s argument is to the effect that the effect of the zig-zag lines indicating the entry into a zebra crossing bring the effect of the bus lane to an end. In the alternative, he submits that those zig zag lines give the appearance to the motorist that the bus lane has come to an end and that it is no longer enforceable, because the requisite signage is no longer compliant and adequate. 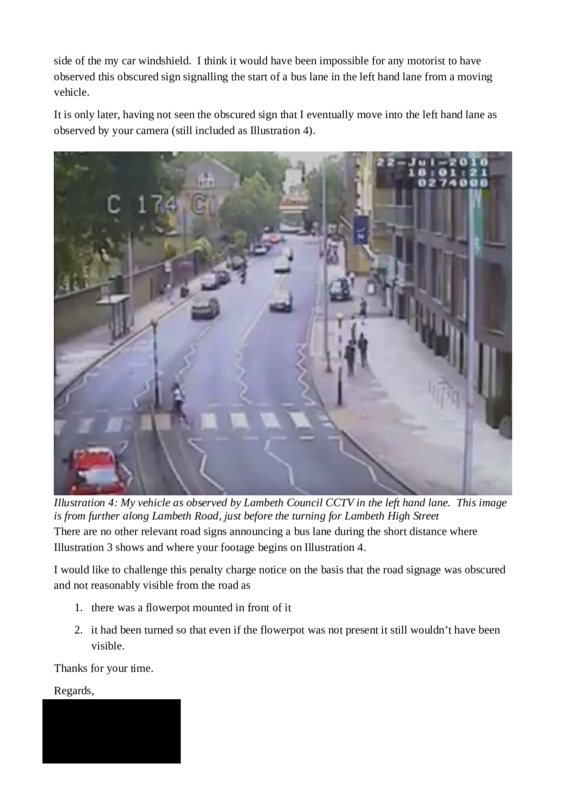 He points to the resumed thick white line and bus lane sign as an indication of the resumption of the bus lane after the junction with Lambeth High Street. That, he says, is inconsistent with the bus lane having remained constant throughout. I would have been assisted by more detailed submissions from the EA on the effect of the zig-zag lines and the limits of the zebra crossing. Indeed, I was not even provided with the TMO, merely with the temporary TMO that changes the times of it. However, given I am familiar with this TMO I am aware of its terms. In particular, the bus lane extends, according to the original TMO, on Lambeth Road between the two junctions referred to above. 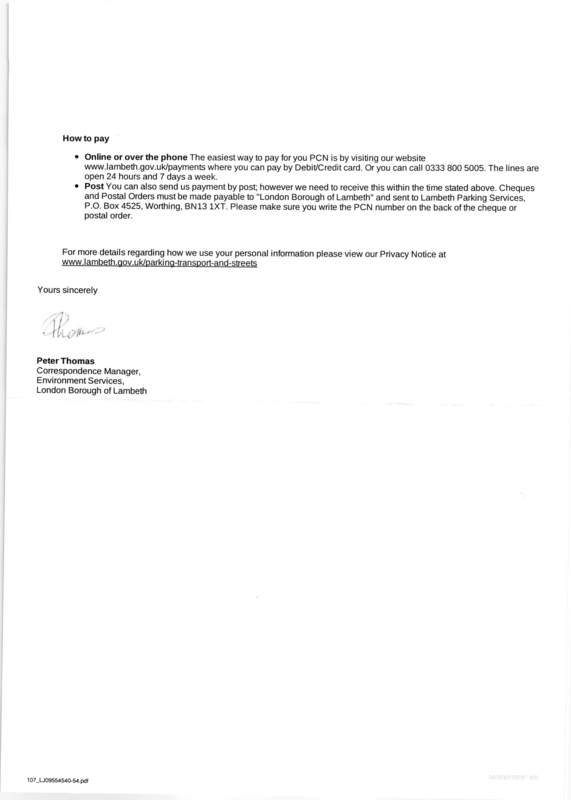 If the EA is correct that the bus lane is effective and enforceable throughout that length, then at the point at which Mr. Stanley crossed into it he was in the bus lane in contravention of the TMO. The information, requirement, restriction or prohibition of a description in column 2 of an item in the sign table in Part 6 must be conveyed by a road marking that is of the size, colour and type shown in the diagram in column 3. 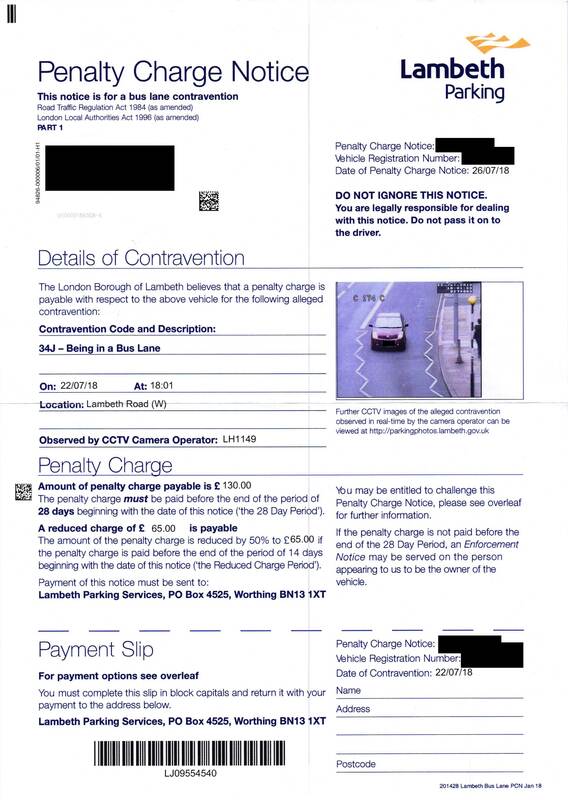 A bus lane is a description in column 2 and the solid white line is in column 3 of Part 6. There are certain exceptions to the requirement for the solid white line, but none apply here. Accordingly, once the solid white line stops, the road marking is no longer compliant with the 2016 Regulations. A motorist would be entitled to think that the bus lane had come to an end. For the reasons I give below, the bus lane has, for the purposes of the zebra crossing, come to an end but, in any event, the mandatory road marking is not present, so the signage is, I find, not compliant with the 2016 Regulations, or adequate to convey adequate information about the prohibition to the motorist, in accordance with Regulation 18 of the Local Authorities' Traffic Orders (Procedure) (England and Wales) Regulations 1996. I allow the appeal on this basis because the contravention did not occur. Moreover, I further find that the signage correctly represents the position that, whatever the TMO states, the effect of the zebra crossing is to create a separate traffic regulatory regime within its limits which ousts the effect of the bus lane. The zig-zag markings indicate a zebra crossing subject to regulations made under s.25 of the Road Traffic Regulation Act 1984. Those regulations include Part 5 of Schedule 14 to the 2016 Regulations. This part contains requirements and prohibitions applicable to zebra crossings, the limits of which are demarcated by the zig-zag lines. One of these requirements is that a driver of a vehicle must not cause it to overtake a vehicle that is stopped or proceeding more slowly in the same direction. That, for example, is inconsistent with the very purpose of a bus lane in which buses have a free-standing lane in which they can pass vehicles in the other lanes, including by undertaking them. That illustrates that the two regimes are not compatible. The effect of the zebra crossing, which concerns public safety, takes precedence over the effect of the TMO. Accordingly, I find that the bus lane ceases to have effect within the limits of a zebra crossing. I would therefore have allowed the appeal on this basis also. Thanks for the above, PASTMYBEST. What does TMO and EA mean? Is that an adjuctation from a form? It is hard to believe you have something from the exact same place!!! The same locations come up time and time again so it's not as unusual as your think. The adjudications are published on the tribunal website and there's a functionality to search by location. I've pretty much decided to pay the fine at half price rather than continuing to challenge. After looking through the database of appeals, I've found that some people who are done at that point get off and some don't. It's about evens.